Every use case can be achieved by implementing a set of relevant requirements. Requirement states what the system needs to deliver. We will identify a set of requirements under use cases. While use case focuses on what user wants to do with our system, requirement focuses on what the system needs to deliver to fulfill the use cases. 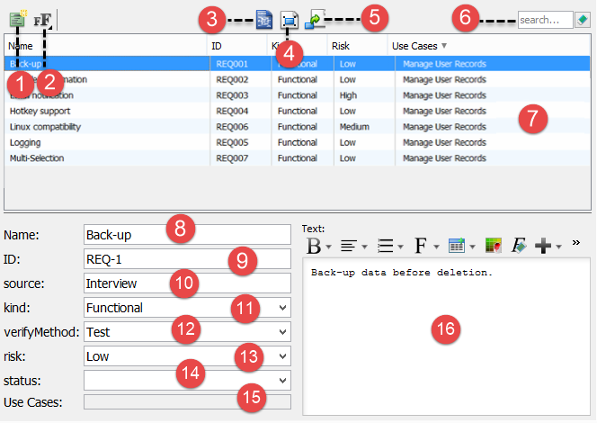 The Requirement List is a place where you can store and manage requirements. You can also gain an overview of requirements involved in the entire system. To open Requirement List, select Modeling > Requirement List from the toolbar. 1 New Requirement Click to create a requirement. 2 Font Size Click to adjust the font size of text in Requirement List. 3 Open Specification… Select a requirement in Requirement List and click this button to open its specification. 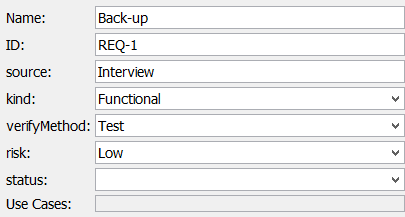 4 Show View… Select a requirement in Requirement List and click this button to list the diagrams that contains the view of the selected requirement. 5 Visualize Select a requirement in Requirement List and click this button to show it in a new or existing diagram. 6 Search Find requirement(s) by entering search criteria. 7 List of requirements Requirements are listed here. 8 Requirement name Name of selected requirement. 9 Requirement ID ID of selected requirement. ID are automatically generated when you create requirement. You may customize the pattern of ID in the Project Options window (Window > Project Options > Diagramming > Model Generation). 10 Source The way how the requirement was created. 11 Kind The type of requirement. 12 Verify Method The way how the requirement can be verified. 13 Risk The level of risk in supporting the requirement. 14 Status The current status of requirement. 15 Use Cases Use cases can be achieved by implementing requirements. If the selected requirement was created from a use case, or added as a requirement of a use case, you can see the use cases here. 16 Requirement description editor Description of selected requirement. The tools above the editor enables you to enter description in rich text format. Click on New Requirement above the Requirement List. Enter the name of requirement. You can optionally edit the properties of the requirement.